Standards that tell you how to understand? Several weeks ago, I spent a lot of time reviewing the grades 3–6 Common Core State Standards (CCSS) and identifying Sketchpad activities that addressed these standards. Through this immersion, I noted some themes that were quite different in the CCSS than the many other state standards I’ve reviewed in my time. One of the things that struck me about some of the elementary school content standards in particular is that they stress how to understand a concept. This is not the norm in other states’ standards. Typical standards note what a student should be able to do, or sometimes what a student should “understand.” But stating specifically how to understand is uncommon. 2.D Construct concrete models of equivalent fractions for fractional parts of whole objects. 2.A Use concrete objects and pictorial models to generate equivalent fractions. NS.3.1 Compare fractions represented by drawings or concrete materials to show equivalency and to add and subtract simple fractions in context (e.g., 1/2 of a pizza is the same amount as 2/4 of another pizza that is the same size; show that 3/8 is larger than 1/4). 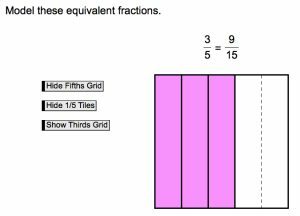 Here are a few screen captures from a Sketchpad activity, “Fraction Tiles: Equivalent Fractions,” that covers all of these three states’ standards. Students first “Show fifths grid” (reveal vertical dashed lines) to begin modeling 3/5. Then they “Show 1/5 tiles” (color three segments) to show 3/5. Then they “Show thirds grid” (reveal horizontal dashed lines) to see that 3/5 is equivalent to 9/15. …then add on a horizontal grid of… what size?… fourths, to show that 2/5 = 8/20. Here’s a more traditional approach, from Key to Fractions, Book 1 (Key Curriculum Press, 1980). Do you think students develop a different kind of understanding or skill from approaching equivalent fractions in these two different ways? Update: Be sure to check out this new Web Sketchpad model of fraction multiplication.